Kyle Simpson, composer, trumpet player, and bandleader, is a graduate from Lawrence Conservatory of Music in Appleton, WI and The University of Montana in Missoula, MT. His composition teachers were Fred Sturm at Lawrence and Charles Nichols at The University of Montana. Simpson has written many works for large jazz groups, chamber jazz groups, solo trumpet, electronic music, orchestra, and wind ensemble. His compositions have been featured at the Buddy DeFranco Jazz Festival in Missoula, where he also performed with Lew Soloff and Paquito D'Rivera. Other compositions have been featured at The Henry Mancini Institute--Los Angeles (2006), Fête de la Musique Ile d'Yeu--France(2011), Uzmah Upbeat---Croatia (2014), Charlotte New Music Festival—Charlotte, NC (2013), and Ostrava Days--Czech Republic (2011). 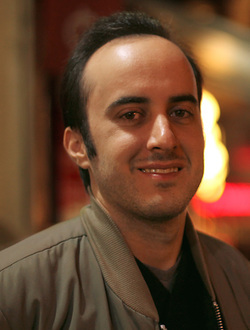 He also received ASCAP’s “Composer to Watch” award in 2011 for his work at the NYU/ASCAP Film Scoring Workshop. Simpson’s music has been described as, “lively with rhythmic vitality” and also, “lyrical with a brooding elegance.” He is currently in the DMA program in composition at West Virginia University where he previously studied with Dr. John Beall and Dr. Joseph Dangerfield, and is currently studying with Dr. Sarana Chou. Born in Boston in 1992, Ryan Stennes is a composer based in Knoxville Tennessee. His interest in music began in high school, where he sang in the school choir. 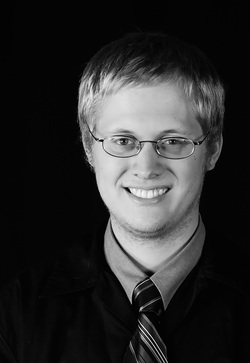 Stennes soon began composing during his senior year in 2011, and in 2013, his work for brass quintet and organ was premiered by members of the Knoxville Symphony Orchestra and Lee University faculty. 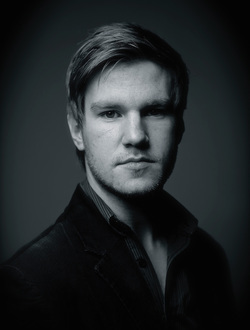 Since then, Stennes has composed works for choir and small ensembles. Stennes currently studies at the University of Tennessee under Dr. Andrew Sigler, and is pursuing his bachelors degree in music composition. Aled Smith (b.1990) is a composer, editor and teacher based in Manchester, UK. Born in Wrexham, Aled began playing guitar at age twelve and was composing by his late teens. Following an undergraduate degree in Music in Liverpool (graduating with First-Class Honours) he continued to postgraduate study at the Royal Northern College of Music, gaining an MMus with Distinction in composition. He is currently reading for a Ph.D. at the RNCM entitled: "Events in construct: the organisation and transformative aesthetic qualities of objects within a musical space", supervised by Adam Gorb and Emily Howard. Whilst studying he has received Masterclasses from acclaimed composers such as Oliver Knussen, Liza Lim, Brian Ferneyhough and Anders Hillborg. Mr. Smith has written music for Alexandra Dariescu (piano), NEW Sinfonia, the British Harpsichord Society, Clare Hammond (piano), Emma Haughton (clarinet), Emily Mowbray (violin), JRNCM, RNCM New Ensemble, RLPO, London Sinfonietta, Ensemble of St Lukes, Borealis Saxophone Quartet, Jenny Carson (soprano), Manchester Camerata, BBC Singers, the Sixteen, the Cornerstone Festival and New Music North West Festival. He has also collaborated with the poet Justine Chamberlain. Paul Duffy (b. 1989) is a doctoral candidate in composition at the University of Iowa. He has studied composition privately with Nomi Epstein, Lawrence Fritts, David Gompper, Josh Levine, and Craig Weston, and has attended master classes with Michael Fiday, David Lang, Elainie Lillios, Louis Karchin, Augusta Read Thomas, and Caroline Shaw. His works have been performed recently at the International Computer Music Conference, Electronic Music Midwest, and the Midwest Composers Symposium. A native of Ankeny, Iowa, Duffy received a Bachelor’s degree in biology from Wartburg College and a Master’s degree from Kansas State University, where he held an assistantship in orchestral conducting and teaching piano proficiency. Yan Pang is one of the most active composers of the new Chinese generation. Her most recent book, Cool Math for Hot Music (co-authored with Guerino Mazzola and Maria Mannone), will be published by Springer in the fall of 2016. She has released a number of publications consisting of “Glorious Times,” published by the China Scientific & Cultural Audio-Video Publishing Company in 2011, as well as the score “Solis Ortus,”and an article “Comparative Music Analysis of Scene of Sichuan Opera,” which were published by China People’s Cultural Art Publishing Company. Ms. Pang has been commissioned for performances in Vienna, St. Petersburg, Prague, and other locations throughout the world. Pang has worked with renowned composers and musicians all over the world, including Samuel Adler at Julliard School, Müller-Siemens at the University for Music and Performing Arts, Vienna, Anekcahp at Moscow Tchaikovsky Conservatory, and more. Diogo Carvalho, born in São Paulo, Brazil, is a composer, scholar, performer, and professor with experience in electroacoustic, concert, popular, jazz, and Brazilian music. He is currently a doctoral composition student at the University of Florida. Carvalho stands out with his ample knowledge and musicality. His works are frequently related to non-musical ideas that generate or inspire creation in different styles. His "Concert for Guitar and Orchestra" (2011) evokes Brazilian musical gestures (Baião, Bossa Nova and Maracatu) in classical form. The electroacoustic piece "Cave of the Harmonic Beats" (2014) explores guitar sonorities with computer processing, using the metaphor of a bat moving in the dark, hearing his movements from sound reflections on the walls. Recipient of an Honorable Mention at the Jury Show 2016 of the College of the Arts (University of Florida), "Clarinetism" (2015) experiment the idiomatic characteristics of a solo clarinet, mainly focused on articulation and timbre. As a scholar, he embraces the relationship between art and research. Carvalho obtained, from the University of São Paulo, his Master of Arts in Music Creation Processes in 2011. His master’s dissertation focused on compositional processes; comprising the transcription for the guitar of works by Debussy and Ravel, his study culminated in the CD "Impressionism – Acoustic Guitar Solo," praised as “highly recommended” by Classical Guitar Magazine. As a guitarist, Mr. Carvalho performs and records solo concerts and chamber music. His third CD, Calavento Duo for violin and guitar, contains many original compositions and was released in Brazil, Russia, Germany, Austria, and Italy. S.R. 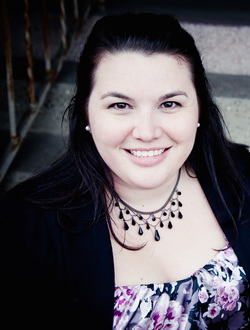 Kisselbaugh received her Bachelor’s degree in Music Research from Murray State University in Murray, KY in 2008. She then attended Ball State University in Muncie, IN, where she earned a Master of Music in Composition in July 2010. She is currently ABD in Music Composition and Theory with a secondary in Choral Conducting at Ball State University. In 2013, Kisselbaugh was an integral part in creating a collaborative concert with the Ball State University Chamber Choir and the student composers. This concert is now a yearly activity and had it’s first call for works this fall. Kisselbaugh is also a member of Ball State’s SCI student chapter and has held the offices of President, Vice President, and Treasurer. “Chiyogami Suite” was recently chosen as part of the Society of Composers, Inc. Region V Student Mixtape, the Society of Composers, Inc. 50th Anniversary Conference, and was performed in Valencia, Spain as part of the Valencia International Performance Academy and Festival. At Ball State, Kisselbaugh studied composition under Eleanor Trawick, Jody Nagel, Keith Kothman, Derek Johnson, Vera Stanojevic, Richard Pressley, and Amelia Kaplan. Jonathan Posthuma (b. 1989) is an American composer currently living in Saint Paul, Minnesota. 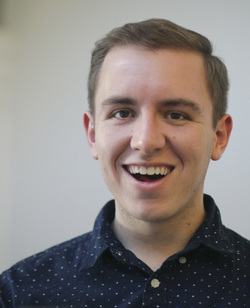 He recently received his Masters in Music Composition from the University of Wisconsin – Madison, where he studied with Stephen Dembski and Laura Schwendinger. His most recent orchestral work, Fili di Perle, received 3rd Prize in the Karol Szymanowski Competition and was performed in Katowice, Poland in March 2016. Excerpts from his master’s thesis, The God of Material Things, a song cycle for narrator, soloist, chorus, and orchestra, which sets the poetry of David Schelhaas, professor emeritus of Dordt College, where Jonathan studied composition privately with Luke Dahn while completing his Bachelors in Music Education, has been premiered with voice and piano in Plymouth, Indiana as part of the Rural Art Song Festival, which celebrates music written by American composers with rural backgrounds. His music for large ensembles includes An Isthmus Aubade, dedicated to Scott Teeple and the UW-Madison Wind Ensemble and premiered in April 2015 and Concerto Grosso No. 1 for strings, percussion, and piano, commissioned and premiered by the Madison Area Youth Orchestra and Clocks in Motion in June 2015. Among his other awards are a 2011 BMI Student Composer Award for Five Studies for Piano: Two Pencils and a Hymnbook and an award for sound design from the Kennedy Center American College Theatre Festival for his incidental music for The Glass Menagerie. Jonathan is currently a freelance composer, but he also sings in VocalEssence and Kantorei, two auditioned choirs in the Twin Cities.